Posted by Glenn Irvine in Blog. I have decided at the start of this year that seeing many of my posts relate to a broader technology base than just the Lotus range of products, it would be appropriate to have a more generic name for the Blog. So as of today, I have re-badged the Blog “A Collaborative View”. This allows me to range amongst many of the topics across many Vendors without a perceptable bias. If you have been following the Blog by RSS Feed, the existing WordPress address (https://thelotusposition.wordpress.com) will continue to operate for about another week, at which point I will change it over appropriately. As of today, (www.collaborativeview.com) will point to this Blog, and I will end the earlier name in due course. Posted by Glenn Irvine in Uncategorized. I’m being a bit cheeky with an early prediction (but it is the month for predictions), and all the pundits are predicting that the new United States CTO, due to be announced later today, will be the current CTO of the District of Columbia, Vivek Kundra. A quick glance at his Blog, will show why he is the leading favourite with a penchant for the Democratisation of Public Sector Information, and transparency of government information. Major planks of President-Elect Obama’s IT Strategy. Interestingly, he also has a strong interest for Mashups. Something that will no doubt be of interest to those that follow the Collaborative (Service Oriented) technologies. In a few hours as Obama’s Cabinet is finalised, we will see if Kundra makes the cut. I’d like to wish everyone a very Merry Christmas and a successful New Year. I hope you all enjoy the season’s festivities, and have a safe break leading into 2009. Posted by Glenn Irvine in Commentary, Futuring, Review, Survey. I was asked to prepare an article on the Cloud Computing phenomenon that has captured the imagination of our industry for the Eos Solutions Newsletter this month. I’ve also added a quick survey poll at the end of the article to see if there is much use of Cloud Computing Services at this point in time. The ICT industry is awash with talk about Cloud Computing, and depending on who you are talking to, you will see different perceptions about what Cloud Computing actually is, from the simplest web-hosted solutions right through to virtualised processing environments (Hypervisors) with Web-Service initiated provisioning and decommissioning. A good example of the former is Salesforce.com. Simply put, this is a generic business solution (in this case CRM) provided via the web on a subscription basis. Salesforce.com was an early adopter of this approach and has had it’s share of problems with outages. An early identified problem with hosted services like Salesforce.com was it’s lack of persistence during an outage or inability to connect to the Web. As Broadband services become more of a Critical Infrastructure Utility, redundancy of service provision should address these concerns to at least the same level as other Telco services. Initiatives like the Australian Federal Government’s NBN (National Broadband Network), in principle, are targeted at addressing the need for this. Amazon was an early entrant in the market for the latter example of Cloud Computing, and that is a service utility that allows the user to ‘switch’ on both processing capacity, and storage as required, like any other utility. This is also paid for as a subscription, and new metrics like Giga-Hertz Hours are used for the pricing models. It is at this level that some of the large vendors see the potential for the future of the software (and to a certain extent, hardware) industries. Amazon’s Elastic Compute Cloud (EC2) allows the imaging of servers and the use of web-services to provision these images on specified virtual platforms. It currently allows a range of basic, to intermediate, to high-performance spec’ed platforms and these are priced on an hourly basis. Using the Amazon Simple Storage Service (S3) a complete application environment can be provisioned from the stored images in a short period of time, used for a defined purpose and period, and then decommissioned. The industry has already started looking at this provisioning model for providing Development Environments on-demand, and it is looking extremely promising from a cost effective perspective. Any significant development-focused organisation is constantly challenged by the lack of infrastructure (due to cost) for all the environments required by their developers. Especially for complex Enterprise type multi-system/server developments. Organisations as large as the New York Times are already using Amazon’s Compute Cloud for archival of news stories. Major Vendors like IBM and Microsoft see this as the next evolution of the software industry. Both have introduced hosted messaging & collaboration platforms into the market in recent times. IBM’s Bluehouse (now in Beta) will be their first main thrust into this market with a complete Collaboration offering provided in the Cloud, and Microsoft’s recent announcement of Project Azure scheduled for release in late 2010, is one of their Chief Architect’s (Ray Ozzie) Major Initiatives looking at capitalising on being one of the first to market for the operating system for Hypervisors and Cloud Computing Centres across the Globe. IBM’s Virtual Enterprise is looking at a similar initiative using the WebSphere stack. Online User Identity Management will become an issue, but some vendors are already looking at the ability to share user credentials across separate web applications. Microsoft has Live Mesh in Beta at the moment, there is Facebook Connect , MySpace Data Availability & Google Friend Connect as well. In the Enterprise, IBM has Tivoli Federated Identity Manager. Persistence & Availability – The ability to continue working during outages or the ability to mitigate outages. Privacy and National Security Concerns – The hosting of information outside of your country’s borders does concern Public Sector organisations. The US Patriot Act for example is a concern for some countries in adopting cloud services. It is thought that Country-siloed Clouds may be able to address this. Geo-Political Information Management Concerns – The Political risk a country takes on by housing information for another country. As this type of delivery mechanism for software services evolves, we will need to address a number of other issues, including the training of developers for Cloud environments (in Universities and Vendor Training), and new privacy, ownership, IP protection and Legal issues will arise. Is Cloud Computing a novel current trend? The investment in this approach by some of the main players in the industry (IBM have a Cloud Computing Research Centre based at MIT), Microsoft’s Chief Architect is rejigging their complete operations around the Software + Services model, suggests that this is not so. The Blogosphere and industry analysts like Gartner globally and Longhaus here in Australia have a firm eye on this emerging disruptive technology. 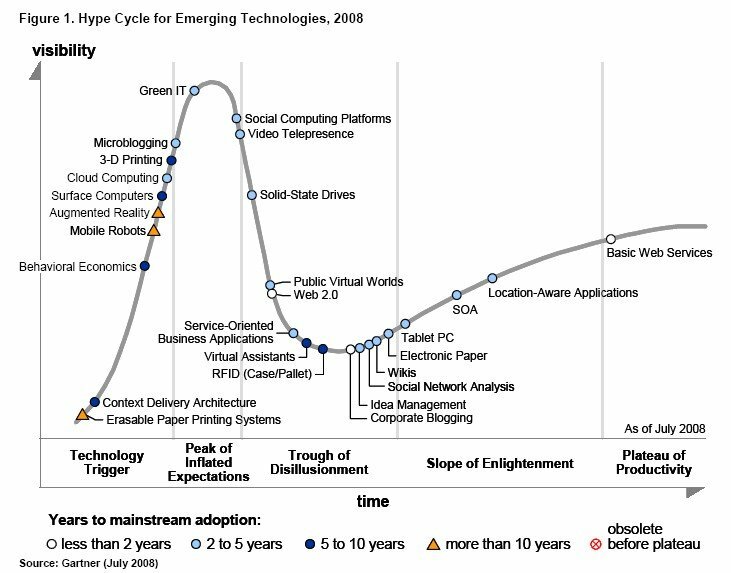 Gartner’s 2008 Emerging Technology Hype-Cycle gives Cloud Computing a 2-5 year timeframe to mainstream adoption. In a recent hypothetical hosted by local industry Analyst, Longhaus, in Brisbane, it would appear that broader adoption by the Public Sector would take longer (up to 10 years) because of the information security and political concerns. In summary, Cloud Computing is an inevitable evolutionary step for our industry, while it will likely be around 5 years before we see mainstream adoption, it is an area of the IT World that is worth keeping a watching brief upon, and some early experimentation, particularly for development environment purposes, would be well worth considering. This is an interesting Visualisation demo for Facebook usage. Have a look at the video demonstrating communications and volumes of comms between the various places on the globe. Interesting to note the large tracks of this planet that still do not exhibit much traffic on the web, or more specifically, have not evolved to significant Social networking use. I also couldn’t help but like the Project title… Speaks to my LOTR interest. Clever title. Ed Brill was first to break this news, but it has now made it to the Australian News in Australian IT this morning. Good to see Nokia supporting the Lotus Traveller product for providing Notes on Nokia S60 3rd Edition devices. Mobile PIM Applications are mainstream these days… I look forward to more announcements like these. Posted by Glenn Irvine in Blog, Events, Futuring. We had Ed Brill visit us in ‘sunny’ Brisbane yesterday, and he presented to a local User Group meeting. Always great to have Ed drop in, he has great insights into the Lotus machine. Of interest were the forecasted launches of Notes Domino 8.5 next month (yes December), and the release of Atlantic (SAP integration in Notes) in March next year. Both of which will have significant interest in the local Lotus market. Some of the features presented by Ed at the PLUG meeting will be well received. I especially like the new way that attachments can be managed to save on email sizes, and the multiple calendar overlays. Some of the screenshots for Atlantic look interesting as well. Posted by Glenn Irvine in Blog, Commentary, Competitive, Media, Survey. This is a big one for the Lotus Community in Australia. Telstra partnering with Microsoft to deliver hosted Exchange, Sharepoint, and Unified Communications will be a big blow to IBM’s efforts. The increased sales coverage, and scalability cost advantages with a quick go-to-market strategy will be very hard to counter. Microsoft is moving fast with alliances in Australia, including incubator efforts with organisations like iLab in Queensland using the BizSpark initiative, winning the hearts and minds of the developer community.